Join us for a night of knitting together. Do you have a project? Need ideas? I’ll put on the tea. Our is an open Book Group- join us! This January join us at Danbury’s Palace Theatre when film historian John DiLeo presents AND YOU THOUGHT YOU KNEW CLASSIC MOVIES: A Film Journey Through Hollywood and America. 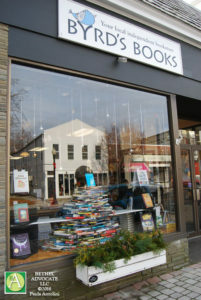 Byrd’s Books is the bookseller for John’s books at this wonderful multimedia event! John DiLeo presents a fun, informative and idiosyncratic history of Hollywood’s Golden Age, while telling a parallel story of America itself. From the Depression to World War II to the Cold War to the sexual revolution, DiLeo presents a vision of just how the movies traveled from 1930 to 1970. Please join us as Byrd’s Books hosts Robert Zupperoli as he presents the Best Children’s Books of 2017. This is a comprehensive presentation with slide show and book samples designed for educators, but wonderful for all adults to learn about some of the best in children’s books of 2017. Materials for hand-outs will be available for those who register- please use “tickets” link HERE.